For a long time in the French and English colonies of America, a strong liquor has been made that carries the name of Guildive, or Tafia or Rum; this last word is English, and the other two are French although the two French words are often confused…‘guildive’ is applied to the strong liquor obtained by distilling the juice of crushed sugar cane … and which has been left to ferment without mixing it with anything. ‘Taffia,’ on the other hand, is made by distilling the syrups and foam created during the production of sugar, after having left them to ferment with the addition of purified water. Following this two-fold classification of sugar cane-derived distilled alcohol, Charpentier de Cossigny takes us directly into the technical details of pre-industrial sugar production, as well as of the distillation of alcohol. Regardless of the final product, and regardless of where it was produced (the Indian Ocean, the Caribbean Sea or in France), sugar and its derivatives were being produced, exchanged, and consumed in greater and greater quantities throughout Europe and the Atlantic world in the eighteenth century because of slavery and the plantation system that had developed around slaves. The democratization of the consumption of both sugar and its derivatives began at the end of the seventeenth century and depended on the low prices of alcoholic commodities. Although the sugar trade has been studied in great detail in histories of the Caribbean and Atlantic world, less attention has been paid to sugar by-products and derivatives, which were an obligatory, indeed ubiquitous, feature of sugar production and necessary to a plantation system. Sugar planters and colonial administrators alike in the French, British, Spanish and Portuguese sugar colonies sought ways throughout the seventeenth and eighteenth centuries to commercialize sugar and alcohol. Neither the crushed sugar cane and nor the scum that is removed from the second and third sugar boiling cauldrons is useless. The scum is reserved in a trough where it is kept to make an eau-de-vie, or brandy. The slaves prepare an intoxicating drink from it, and it sells quite well on the islands; sugar syrup also sells quite well because it is used in making spice bread in Europe. … these little tricks contribute significantly to a well-run sugar plantation. Du Tertre’s co-religionist, the missionary Jean-Baptiste Labat writes a few decades later about the place of enslaved workers in these local and regional economies that grew up around sugar. On sugar plantations where there are two rum cauldrons, 160 pots can be produced weekly, more or less. This Manufacture renders a considerable profit to the Planter; because even only when working 45 weeks a year, this still results in 60 barrels of rum, of which at least 54 can be sold, the remainder being consumed on the plantation. Here, Labat could well be raising the question of slave consumption of rum, which was a central feature of plantation life. Informally, slave consumption took place through the proximity of slaves as producers, that is, through ‘theft’, as noted by planters and colonial administrators throughout this period. More formally, rum was distributed to slaves as part of their rations, and more significantly as both rewards and incentives for particularly difficult or dangerous work, which was often then associated with the running of the sugar mills where the cane was initially crushed, leading to high rates of mutilation and death. In addition, the Code Noir forbade the distribution of rum in lieu of prescribed provisions that slaves were owed, indicating that this was another practice. This practice is a particularly apt example of the importance of informal economies to the Atlantic world: slaves were not paid for their labour, which nevertheless was highly valued, and the custom of giving rum in exchange for labour and risk was integral to the highly specific local economies that developed out of the material culture of sugar plantations. In 1713, because of the lobbying of the powerful brandy producers frantic at having lost the British market during the War of Spanish Succession, a law was passed in France making it illegal to either produce or import distilled alcohol made from anything but wine, a law that stayed in effect for most of the eighteenth century. While English rum was making its way into the Royal Navy, onto fishing vessels headed for Newfoundland and slaving vessels headed for West Africa, and English molasses into the kitchens of both England and New England, the French metropolitan restrictions on rum production and exchange ran both broad and deep, in the first instance dramatically decreasing the value of both French rum and French molasses. Rum produced on the French islands remained the drink of slaves and expanded to some degree throughout the Americas, most often as return cargo for shipments of provisions coming from both French and British northern colonies. Distilled alcohol was certainly making its way into France’s northern colonies of Louisiana, Acadia, and Canada in the seventeenth century. It was consumed in the towns of Montreal, Quebec, Trois-Rivières, and Port-Royal (and New Orleans in the eighteenth) and traded with Amerindians in the fur trade, but it was not derived from sugar cane syrup. Instead it was almost exclusively French brandy, shipped in the seventeenth century from La Rochelle, and later from the other major Atlantic ports such as Nantes and Bordeaux, as well. Although there are no records establishing exactly when brandy was first introduced to New France as a trade good, it was almost certainly in the first third of the seventeenth century, well before sugar cane plantations and refineries were established on the French-occupied islands of the Caribbean. Despite this early date, it is likely that the Dutch or the English were, in fact, the first to trade some kind of brandy with Amerindians at Orange in the early seventeenth century. There is evidence that English fur traders in what is now Maine were trading aqua vitae for furs in 1633, and that the Dutch were trading their own brandy for furs in the same decade. Somewhat ironically, there are strong possibilities that the Dutch brandy being traded had as its base material sugar syrups from the French Caribbean islands. The same transatlantic trade in French sugar syrups that produced the spice breads that Du Tertre noted in the 1660s delivered the base material to Dutch distillers in their own country. The history of inter-colonial trade between France’s southern and northern colonies is really the history of a series of failed initiatives. The first half of the eighteenth century saw the significant growth of an inter-colonial trade between the two major French new world centres – a trade characterized by the exchange of rum and molasses for provisions. This growth was largely the result of the establishment of the fort of Louisbourg in 1713, which for 40 years functioned as a French entrepôt for goods coming from the French Antilles, New France, and despite the questionable legality of it, from New England. Nonetheless, this relatively brief period did little to dislodge the pre-eminence of French brandy within New France and as a trade good throughout the eighteenth century. The region of the Americas which ultimately absorbed the greater part of French sugar by-products was, in fact, New England. The fact that the trade between the French Antilles and Massachusetts, Rhode Island, Connecticut, and New York in the colonial era was illegal makes this longstanding set of exchanges – New England provisions for French molasses and to some degree, rum – one of the great histories of smuggling in the new world. The beginnings of this trade dates from the mid-seventeenth century with the development of both regions, but gained particular momentum after the turn of the eighteenth century. This momentum was the result of pressure from both the British and the French on both sides of the Atlantic. The 1713 legislation forbidding the production and importation of French rum dropped the value of its base material (French molasses) precipitously. Cheap French molasses was immediately attractive to New England traders, in preference to more expensive British West Indian molasses. And what did the New Englanders want with all this molasses? Well, as John McCusker has shown, they were developing their own rum industry, an industry propelled forward largely because eighteenth-century wars were making French brandy scarce in both England and New England. Although the role played by French molasses at the beginnings of the industry was minor, by the late 1760s, molasses from the French West Indies made up 87% of the molasses used in New England distilleries, in what was the first vital manufacturing sector of the thirteen colonies. So British markets for both New England and British West Indian rum grew in order (at least partly) to replace French brandy and largely (in the case of New England rum) on the back of French molasses, while markets for French West Indian remained limited. There are really three overlapping global contexts of the circulation and consumption of French Caribbean rum and molasses in the seventeenth and eighteenth centuries. The first is the trans-imperial introduction of distillation, as a process, to the Americas, where it was applied to a New World base material – sugar syrups, and the shift from fermented alcoholic drinks, such as wine and beer, to distilled ones. The second context is the trans-imperial, trans-American commercialization and diffusion of both by-products of Caribbean sugar cane plantations and their implications for everyday consumption habits. The final context is the transatlantic and, indeed, global trades that French rum and molasses entered into, as low-price French molasses was sold to the Dutch “for their spice bread” and French brandy producers lobbied the French Crown to keep rum out of France to protect their own global trades. Bertie Mandelblatt is adjunct Assistant Professor in the Department of History and the Caribbean Studies Program at the University of Toronto. She is currently teaching courses on the Haitian Revolution, Caribbean foodways, and Atlantic history. Her research broadly concerns commodity culture and political economy across the French Atlantic. Her first book project focuses on food consumption and plantation slavery in the Franco-Caribbean during the colonial period. Her second book project concerns the transatlantic production, circulation, and consumption of rum and molasses across the French Atlantic. You can contact her at bertie.mandelblatt@utoronto.ca. 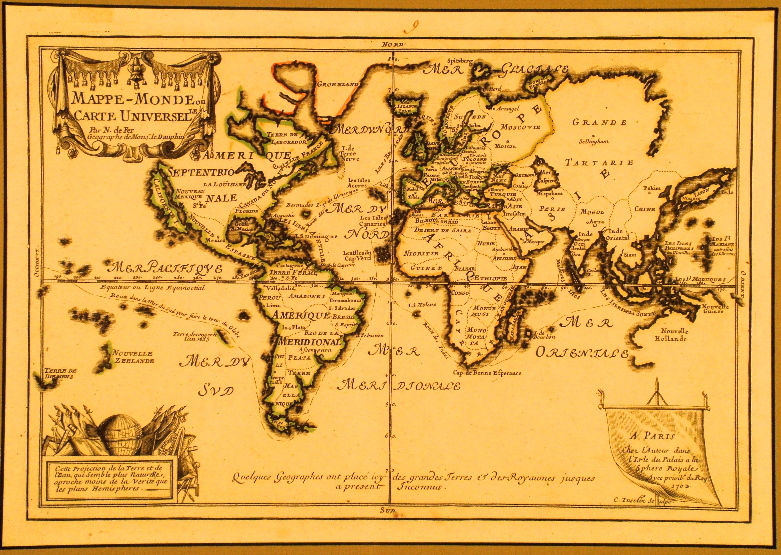 Title image: Mappe-Monde ou le Carte Universel. Nicolas De Fer. Paris, 1702. Joseph-François Charpentier de Cossigny, Mémoire sur la fabrication des Eaux-de-Vie de Sucre…, l’Isle de France, 1781, p. I-II. Jean-Baptiste DuTertre, Histoire générale des Antilles habités par les Français…, Paris, 1667-71, vol. II, p. 124. Jean-Baptiste Labat, Nouveau voyage aux isles de l’Amérique, contenant l’histoire naturelle de ces pays…, Paris : G. Cavelier, 1722, 6 tomes; tome 3, p. 410, 415. Italics are for emphasis. John J. McCusker, The Rum Trade and the Balance of Payments of the Thirteen Continental Colonies, 1650-1775, PhD Dissertation, Department of History, University of Pittsburgh, 1970, p. 423. Thanks for the excellent and informative overview of the expansion of rum consumption through capitalist exchange and the growth of hegemonic colonial networks. Fredric Smith’s 2006 “Caribbean Rum: A social and economic history” may be a useful additional resource, especially given the extent to which European books from the seventeenth and eighteenth century (and even academic works from the third quarter of the twentieth century), presenting African Americans primarily, as you note, as thieves or passive recipients of rum in lieu of rations. More recent research has helped show the extent to which enslaved Afro- Americans actually invented the drink, and the context web of highly localized but also regionally discursive relationships, positive and negative, that they have had with it. Thankfully, while it may be true that “less attention has been paid to sugar by-products and derivatives”, the study of rum hascome a long way in recent years from relying on slave-holding “planters and colonial administrators” to tell us that “Informally, slave consumption took place through the proximity of slaves as producers, that is, through ‘theft’”.